A world-first online course from the University of Newcastle (UON) has received global recognition, taking out the prestigious edX Prize for Exceptional Contributions in Online Learning and Teaching at an international ceremony. 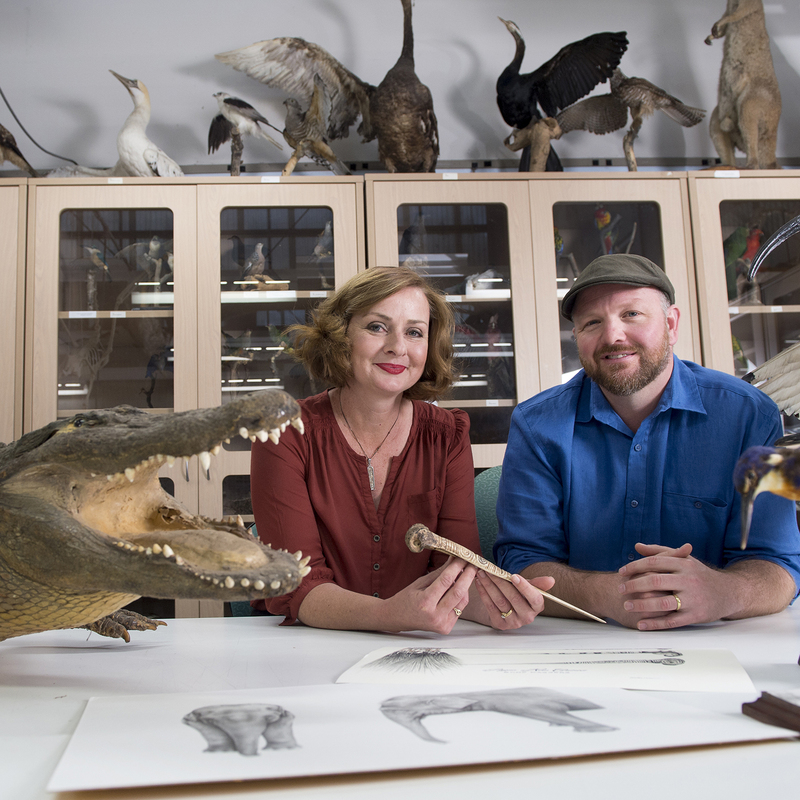 Drawing Nature, Science and Culture: Natural History Illustration 101, delivered by UON academics and artists Dr Andrew Howells and Dr Bernadette Drabsch, took out the top award. Hosted on edX, the leading online learning destination founded by Harvard and the Massachusetts Institute of Technology, the ground-breaking course made history in 2016 as the first Massive Online Open Course (MOOC) to teach illustration. The course offers participants anywhere in the world the opportunity to learn from talented artists, online for free. edX CEO and MIT Professor, Anant Agarwal, recognised the significance of the win. “We are delighted to present the University of Newcastle Professors Andrew Howells and Bernadette Dabsch with the edX Prize. “The Drawing Nature, Science and Culture course is not only beautiful and creative, but it is also an incredible example of excellent and innovative course design and delivery. The course harnesses the power of learner focused online teaching techniques, effectively simulating the experience of the traditional face-to-face studio environment for learners all over the world. “We are honoured to recognise Doctors Howells and Drabsch and we thank them for their dedication to the edX mission of increasing access to high-quality education for all learners, everywhere,” he said. Dr Drabsch, a leading researcher who specialises in archaeological illustration said the award represented the culmination of hard work and effort across UON. “I am absolutely thrilled that our work has been recognised internationally in such a competitive category. “This was a truly collaborative project across the University, and one that has radically changed natural history illustration to incorporate cutting-edge, digital technology – I am so proud to have been a part of this journey,” said Dr Drabsch. Dr Andrew Howells, an acclaimed artist and passionate conservationist whose graphite works of native fauna have been featured in global publications, added that he was delighted to influence a new wave of conservationists. “We’re ecstatic at the success of a world-first natural history illustration online course, which enabled an incredibly unique digital delivery of technical drawing skills. “What I love is that anyone passionate about drawing or the natural world now has the opportunity to upskill or explore developing a new way of appreciating, and ultimately bringing attention to, the beauty of our planet,” he said. The edX Prize is an annual award to celebrate the contributions and innovations of MOOC teachers in the edX community. UON Vice-Chancellor, Professor Caroline McMillen, said the win was a well-deserved recognition of the team’s outstanding innovation in teaching. “I congratulate Dr Howells and Dr Drabsch for their impressive work in creating this exceptional program that so thoughtfully bridges the scientific, the creative and the digital for a wonderful educational experience. I also acknowledge the contribution of Dr Melanie James in providing energy and leadership for this key project. “Through partnering with edX we are proud to bring our leading programs to a global audience, and to showcase the talents of our remarkable staff,” she said. UON Head of School for Creative Industries, Professor Paul Egglestone, echoed the Vice-Chancellor’s congratulations. “This is a very exciting moment in the evolution of the School of Creative Industries here at UON. It’s testament to the incredible talent and hard work of a dedicated staff team. “It’s also a clear demonstration of our cutting-edge approach to the delivery of high quality education packaged in a format that has proved hugely popular with our students enabling them to study what they’re passionate about at their own pace – wherever they are in the world,” he said. The edX Prize for Exceptional Contributions in Online Learning and Teaching was awarded at the edX Global Forum in Whistler, British Colombia on December 6.